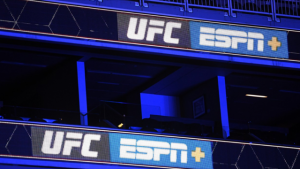 According to MMAFighting.com’s Shaheen Al-Shatti, “UFC and ESPN have inked a deal to make ESPN+ the exclusive new home for PPV’s until 2025 for fans in the United States.” The news comes on the heels of UFC president Dana White himself announcing his own new deal with the company. According to an ESPN report by Michael Rothstein, “The president of the UFC announced Monday that he has agreed to a new seven-year deal to continue running the world’s leading mixed martial arts circuit.” What this essentially means is that ESPN is all in, they’ve hedged their bets on mixed martial arts and ESPN and the UFC wanted to make sure Dana White was coming along with them for the ride in the process. Al-Shatti would go on to elaborate on the UFC’s new signing, stating, “basically If you want to order UFC 236 or any PPV for the next six years, it’ll need to be through ESPN+.” The announcement is the latest in a series of moves from combat sport promotions who are aligning themselves to generate revenue away from the traditional pay-per-view model and moving into the digital platform age. According to Matthews, “In reality, all the risk seems to be on DAZN, which is spending billions in trying to seize the U.S. sports market away from the likes of ESPN and Fox.” With news of the UFC committing to ESPN for the foreseeable future, the competition between DAZN and ESPN just got a little bit fiercer as the next piece of the puzzle has revealed itself in the bid for the U.S. sporting market supremacy. “’The guy wants to come out and tell lies and say things that make no sense when he doesn’t know what he’s talking about. He knows nothing about this sport. He doesn’t know the [expletive] guys’ names who are fighting on his card. He’s a liar. He’s a phony and God help anybody who wants to go fight for Golden Boy,” said White. Iole would go on to state that, “De La Hoya has chastised White for not paying his fighters enough and said he will promote another MMA show because so many UFC fighters are approaching him saying they’re underpaid.” Indeed, any alternative avenue that results in undervalued fighters getting paid after a career of getting short changed is a positive thing and a threat to the UFC’s compensation paradigm. Interestingly, a January 3, 2019 mmanews.com article titled, “Oscar De La Hoya Claims His MMA Event Is Why PPV Is Dead,” author Jon Fuentes quotes Golden Boy front man de La Hoya as having recently told a fan, and I quote, “and that’s why it’s dead you dumbass” after having been confronted over Golden Boys inaugural MMA event between MMA legends Chuck Liddell and Tito Ortiz which had varying accounts of success depending on who you ask. With the recent announcement between ESPN and the UFC, it looks like there was more bark to de La Hoya’s bite than what was initially thought as the UFC looks to follow in Golden Boy’s footsteps in moving to the digital platform model themselves with ESPN+’s video streaming subscription service. So, while PPV doesn’t appear to be dead, it does appear to be flowing like water. Conforming to its new environment, taking the shape and form of whatever its new vessel may be. Whether or not de La Hoya killed PPV remains to be seen, but one thing is for sure, change is in the air and the UFC’s alignment with ESPN is good business for everyone involved. Not the least of which will be the fans who will have the opportunity to be exposed to a healthy dose of mainstream mixed martial arts on a consistent, regular basis with ESPN rolling the dice and going all in for mixed martial arts broadcasting throughout the 2025 contractual agreement with the UFC.